I've never been much of a car guy, but I do love the lines, colors, and signature design touches of the automobiles made in the 1950s and 1960's and even into the 1970's. Today's cars all look the same to me - black, white, or silver with nearly identical aerodynamic body styling that I can't tell apart without seeing the badge or logo. 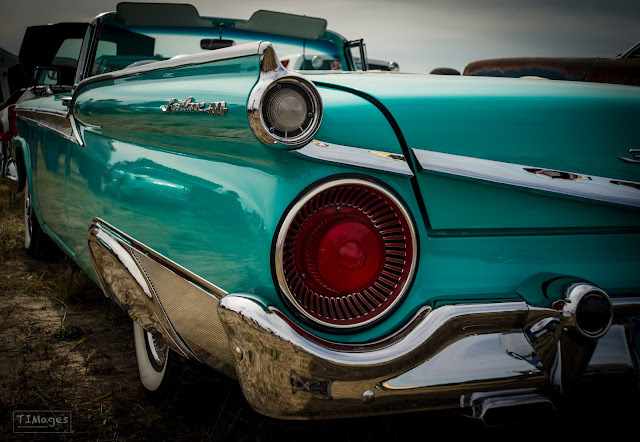 Not so with the old beasts - one glimpse at these taillights and you knew immediately it was a Ford Fairlane 500 and with that color it was somebody from out of town. Probably a '59, somebody will know.